The Gefen GTV-HTAUDPROC is a TV Home theater audio processor. 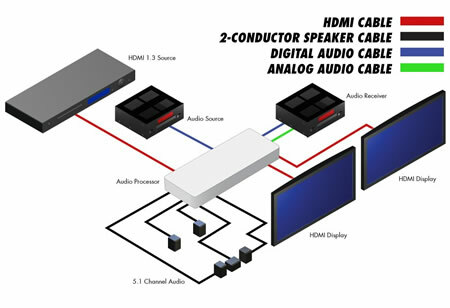 It takes a single HDMI source and a single S/PDIF digital audio source as input and outputs two mirrored HDMI streams, two digital audio streams (S/PDIF and TOSLINK) and analog L/R audio in Surround Sound 5.1 format on both a bank of RCA connectors and a bank of external powered speaker terminals on the rear of the unit. An RS-232 port on the back of the unit allows wired control via a PC or a control system such as Crestron. Speaker outputs are amplified at a maximum of 20W per channel RMS. High-quality plated conductors insure good connections. A Bi-Amplified speaker configuration is supported (please see Notes section). Connect an HDMI source to the Home Theater Audio Processor. Connect the 2 mirrored HDMI outputs on the rear of the unit to HDMI displays or HDMI-compliant A/V amplifiers. Feed the S/PDIF and TOSLINK digital audio output streams to the inputs of your amplifier or sound system using extension cables. Speakers may be connected at the speaker terminals by inserting bare wires or connector stems and tightening down the screw heads firmly. Once all connections are made, power up the Home Theater Audio Processor. On the connected powered speakers and/or external equipment fed by analog or digital hookup cables, you should hear digital audio extracted from the embedded HDMI audio or the S/PDIF digital audio stream. Switching of input sources and fine-tuning of settings may be accomplished using the included IR remote control or the selector buttons on the Processor front panel. A user-friendly LCD display helps guide the operator through all actions. Note: The Gefen TV Home Theater Audio Processor outputs a maximum of 5.1 channels of Surround Sound audio regardless of the actual number of channels of audio present in the original source signal. The Home Theater Audio Processor supports a Bi-Amplified Front Left and Front Right configuration. This capability is available through two extra dedicated connectors within the banks of powered analog audio outputs. Please refer to the user's manual for more details.